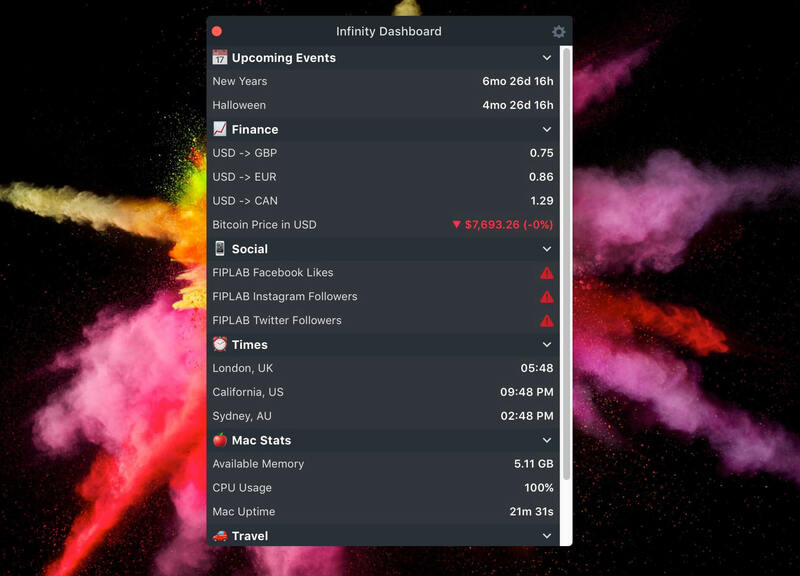 Infinity Dashboard lets you track anything through its wonderfully organized interface. With over 35 integrated modules, you can monitor things ranging from the current climate, travel times, statistics website, stock prices, birthdays and more. You can even write your own custom modules to track just about anything you want. Having all data points tracked and automatically updated in one application means you do not need to waste time throughout the day constantly reviewing multiple web sites just to keep informed of what matters. See profits from your App Store, YouTube views, Facebook fans, Fitbit statistics, exchange rates, information on the Mac system and eye. Certain modules support notifications that allow you to receive alerts about important changes to the data being tracked. For example, you may receive a notification when you change the price of a product is crawling on Amazon. You can add a relevant emoji icon next to a group created in Infinity Dashboard to further customize the interface; also it helps to easily identify different sections within your dashboard.